Document Management Cuts Costs - BizTech Solutions, Inc.
INDICIUM Document Management from INDICIUM Software, Inc. Custom Map Management System from BizTech Solutions, Inc. The client is a leading provider of cable services, and one of the world’s foremost communications companies, with 24.1M cable customers, 15.2M digital cable customers, 13.2M high-speed internet customers, and4.6M voice customers. The company’s Midwest location serves as a hub for the Chicago metro area and is responsible for the system of cables, routers and other equipment necessary to provide cable services to the region. To aid them in their task, field technicians rely on the information contained in approximately 20,000 network maps which diagram the wires and routes in the region. 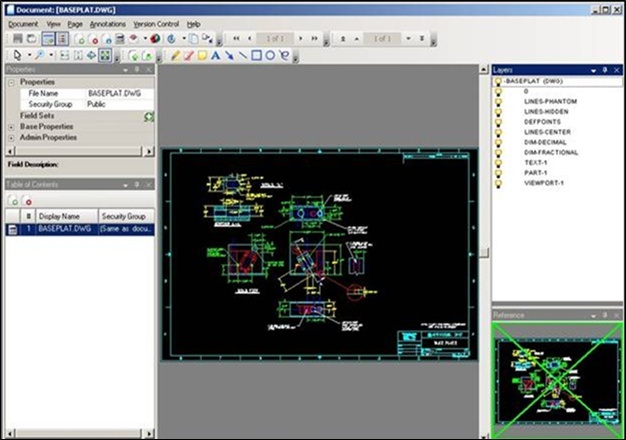 A full-function CAD program was used to access the maps, whether for updating or simple viewing. This was quite costly, since the majority of users were not performing updates. At the beginning of each day, the field technicians would use the CAD software to attempt to find the current version of the map(s) they required for that day’s work. After finding each map, they would print a copy to take with them onsite. Anyone could access any map, and people accessing the same map would not be aware that someone else was using it. At the end of the day, the paper maps with the technician’s notes/corrections written on them were to be returned. The engineering department‘s Design Group would add the notes back into the electronic file. At times however, the files were either not returned in a timely manner, or were never updated in the electronic file. This meant that eventually the electronic file became out of date, and a team had to be dispatched to survey and redraw the map, resulting in time delays and additional costs. BizTech worked with the client to design and implement the Map Management System (MMS), which leverages the advanced security and versioning capabilities of INDICIUM DM. INDICIUM DM’s out-of-the-box functionality enabled a custom solution without the cost of customized support. Using the product’s built-in security, the MMS allows authorized access/printing of the maps via a low-cost viewer for the majority of system users. Map access is tracked. Update capability is limited to those users who are authorized to make design changes. Version control allows the review of historical system design/architectural changes, i.e. “before and after” views. Today, some 200 users access the MMS via the company intranet to securely check out the maps they need for their work day. Anyone else needing to see those same maps can do so, but are notified that the maps have been checked out for revision. Once changes have been made to the network maps, they are revised electronically and checked back into the MMS under a new version number.